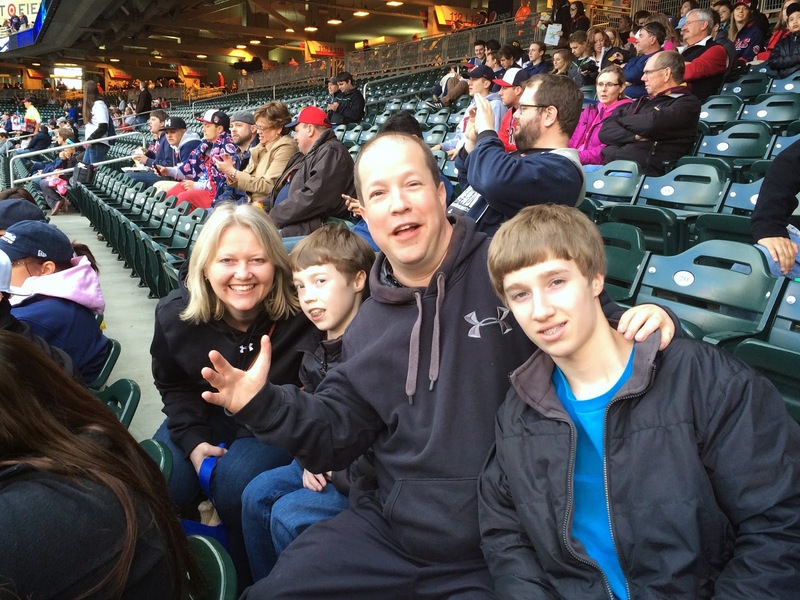 On Tuesday night we went to Target Field to watch the Minnesota Twins host the Boston Red Sox. We're not big baseball fans but we like to get to 1 or 2 games every summer. Baseball is so much better in Minnesota now that we have an outdoor stadium. Except when it's cold, rainy, windy, humid, or too hot. Other than those times, it's really great! The reason we went to this game was to see my buddy, Ron "Sugarman" Myers and two of his sons. They're HUGE Red Sox fans and had tickets right above their team dugout. We ended up sitting in different sections than them and decided to leave the game early when it ended up going past 11PM and our boys had school the next day. Ron and his sons were going to spend the night with us, but decided since it was so late and I had to work the next morning to instead drive home to Iowa. But it was really nice seeing them when I took this picture! We sat in a section that was prone for foul balls landing nearby, which was a nice way to help keep the boys off their cell phones. Every time the bat would crack with a hit, I'd shout "Look Out" which would cause them to look up suddenly in fear. That sure was fun while it lasted. Big Papi David Ortiz hit the first of his two home runs a second after this photo was taken. But even with his powerful play, the Twins held on to beat the Sox 8 - 6. Not that we saw it. We were home in bed by the time the game wrapped up. But it was fun to see these home runs! In what is starting to become a Friday night ritual, I went out to the casino with our friends, Jason and Jen. I'm hoping the next phase of the ritual begins to include letting us win some of the time. That would sure make it a lot more fun. We put our boat in the water on Saturday. This summer I was able to work out a deal with my neighbor to rent a space on his dock to store the boat which makes us excited. As a matter of fact, Sunny was jumping for joy shortly after we put it up on the lift. The boys were happy to go for their first ride of the year even if they did worry about the dog a bit too much. They keep thinking he's going to fall or jump off the boat. He has a real tough time getting back on board so I understand their concern, but I want him to get used to being on there. Then we can push him off when he least expects it. The water is still a bit too cold to actually get in it, so we spend most of our time bird watching. this one is known as a "Grayish Blackish Bird with a Yellowish Beak". They are known for standing on branches and looking to the right. Sometimes they like to sit directly below their mates so they can be pooped on. It's a weird quirk of theirs, but they seem to enjoy it. These birds are called "White Birds with Black Heads and Orange Beaks and Feet." They can usually be found standing on buoys. They seem to prefer buoys with stripes of paint that match the color of their feet. They also seem to always have angry looks on their faces. We just love bird watching! !